In Open Social you can choose to have ANY page on the site as your homepage. The best functionality to use for this is the Landing Page. You can create an attractive page using various sections and you can choose to add a stream and side blocks to it as well. 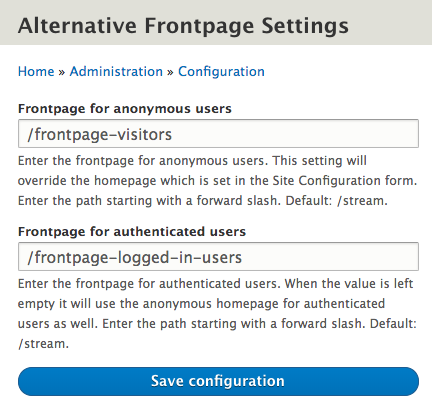 How do you configure the homepage? Firstly, choose or create the page you want as your homepage and give it a clear URL (see example below). 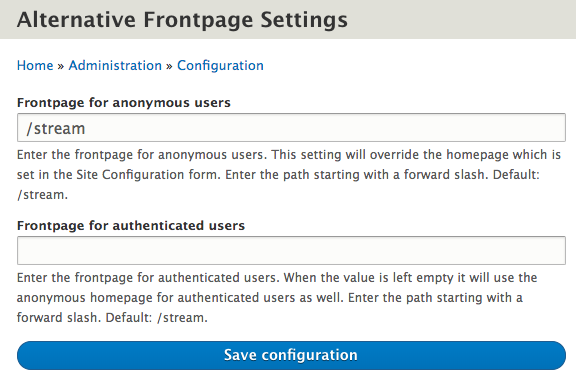 Next, go to the dashboard and choose "Alternative Frontpage Settings". In there you can specify which URL should be used for the homepage for anonymous users/non-logged in users, and which one should be used for logged-in users. You can also choose to show the same homepage for both types of users, but be aware that not all content is visible to non-logged in users. So be sure to check that first. Note: You only have to enter the last part of the URL, so if URL of the page is 'www.mycommunity.getopensocial.com/welcome', you only have to insert the '/welcome' part. In this case, a URL Alias has been set. When this function isn't being used, Open Social's URLs usually look more technical, for example: www.mycommunity.getopensocial.com/node/240.